Are you looking for a way to get rid of mold on walls, floors and other surfaces? 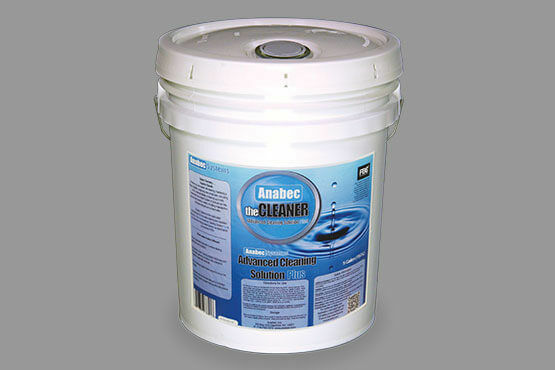 Anabec’s Advanced Cleaning Solution Plus is the product for you. Advanced Cleaning Solution Plus is a ready-to-use, patented cleaning agent that removes and prevents the regrowth of mold, mildew, and bacteria. Advanced Cleaning Solution Plus also helps to get rid of stains and odors, and is great for treatment of block, cement, upholstery, carpet, ceiling tiles, brick, wood, or drywall surfaces. The application of the Advanced Cleaning Solution Plus is perfect for the DIY project as it can be done with a spray bottle, fogger, or even by hand. Once clean, we recommend applying AnaSphere as a sanitizer and deodorizer, and X-70 or X-90 for a microbial barrier. Pro Tip: Never use bleach to clean mold! Although bleach can kill mold on hard, non-porous surfaces, it is not effective at soaking into wood or other porous surfaces to kill the roots. This means that the internal mold will survive and grow back. Purchases Submitted A Customer Purchase is considered “placed” or “submitted”, when our system issues a Confirmation of Your Recent Order email to you. A “submitted” order is not a binding agreement. We reserve the right to decline or cancel any or all of a submitted Customer Purchase. Fulfillment Customer Purchases will be processed in the order in which Crawl Space DIY, LLC, receives them. Customer Purchases will be processed Monday through Friday 8:30 am to 5:00 pm, Eastern Standard Time. In most cases Customer Purchases received by 2:00 pm (EST) will ship the same day. Purchases received after 2:00 pm will be shipped the following business day. Backorders If you place an order for an item that is not in stock, your item will be considered a Backorder. Your entire order will be placed on hold and shipped only when the order is complete. If you know an item will be considered a Backorder and you want the rest of your order to ship before that item is available consider placing two separate orders. Note: In most cases this will result in higher shipping costs. Changes to your purchase by You Once submitted, you can not change, modify, or cancel an order online. If you need to make a change please call our Customer Service Department, 844-643-5711, during business hours, as soon as possible and discuss your situation with one of our Representatives. There are limited things the Representative can change but we will do what we can. Additions to or Changes to submitted orders that result in additional purchases and or shipping costs will require you to place the additional purchase online. Changes to a submitted order will not be accepted via email or voicemail. If you have a concern about your order or you place an additional order and want us to consolidate them into one shipment and one shipping fee, please call Customer Service. We will do what we can. Customer Service is open Monday – Friday, 8:30 am to 5:00 pm (EST). Changes to your purchase by Us. We will not change your order or make substitutions without contacting you prior to shipment. If, due to product availability or changes in our inventory, the need arises to change your order we will contact you via email and/or phone. Our Shipper is subject to change from time to time. Currently UPS handles most of our deliveries but we work with multiple Shippers. Some purchases (based weight and/or dimensions) and some delivery location require a specialized Shipper. Please call Customer Service after you receive your Order Confirmation if you know your delivery address presents special circumstances. Email notification will be sent to the Customer’s email address of record. (The email address you entered when becoming a Registered User or that you changed in your Registered User account profile.) Emailed shipping notification will include the name of the Shipper, the date and usually time they picked up your shipment, the shipment tracking number as supplied to us by Shipper, and either a web address or phone number you can use to track your shipment. Shipping dates are not a guarantee. Shipper will provide you an expected delivery date that is subject to change. Allow extra time for shipping. We reserve the right to accept or reject orders in whole or in part being shipped outside the continental United States. Additional fees may apply to international deliveries. Original Manufactures Packaging. Crawl Space DIY, LLC will ship all products as the manufacturer packages them. Small, loose, or bulk items may be packed together. Orders will be consolidated and packed for shipment subject to the rules and policies of Shipper. Damage or Loss. Liability for your Order during shipping and delivery will be transferred to Shipper. Damage to, or loss of, Orders during shipping will be the liability of Shipper and the remedy will be subject to the policy and procedures of Shipper. If this should happen please call Customer Service and let us help you. Please use returns@crawlspace-diy.com for questions regarding returns and exchanges. Fulfillment Errors Sometimes human error occurs in pulling together and packing orders. If we made a mistake we will fix it. Please contact our Returns Department at returns@crawlspace-diy.com to let us know. Returns Please contact us at returns@crawlspace-diy.com to begin the return process. Unopened, unused, and undamaged products in their original quantity may be returned within thirty days (30) of purchase. Shipping is not refundable. Additional shipping charges may occur. Return shipping charges for non-damaged items will be paid 100% by the customer and not by Crawl Space DIY. We charge a 15% restocking fee, which will be deducted from your refund. Exchanges Please contact us at returns@crawlspace-diy.com to begin the exchange process. Unopened, unused, and undamaged products in their original quantity may be returned for exchange within thirty days of purchase. Shipping is not refundable. Additional shipping charges may occur. There is no restocking fee for exchanges. Merchandise damaged in shipping See shipping policy for details. Let us know by email at returns@crawlspace-diy.com or call Customer Service at 844-643-5711 so we can help you with the process. Missing Parts or Defects If you purchase a product from us that arrived in the original manufacturer’s packaging and you discover there are parts missing or the product is damaged. Or, you received a product that is defective due to defects in manufacturing or workmanship. Contact us at returns@crawlspace-diy.com, or call our Customer Service at 844-643-5711. Rest assured, the products we offer have been selected because they are high quality and their manufacturer’s provide us (and therefore you) excellent customer service. Product Safety Product safety is one of our top priorities. When applicable, each product page on our website includes a downloadable Product Safety Data Sheet. Warranties and Guarantees You, the customer, are responsible for the accurate completion and submission of any or all Manufacturer’s product registration and/or warrantee registration information. Each Manufacturer has their own process of collecting warrantee and registration information and detail will be found in the product’s instructions packet that comes with their product. All products sold by Crawl Space DIY, LLC are subject to their manufacturer’s warranties or guarantees. Please contact our Customer Service Department for information on how to contact our manufactures warrantee department. Recalls or Product Safety Warnings In the event that we receive notice from any of our product manufactures or distributors of a product recall or warning about Product Safety we will post their notice on our website. In the case of a recall, we will attempt to email a notice to Customers who purchased that model of product through Crawl Space DIY, LLC using your email address in our system. Product recalls and Product Safety notices and their remedies, if any, are a transaction between the manufacturer and you, the Customer. We assume no liability through our attempt to help communicate the message to you. Anabec X-90 is a solid white moisture barrier coating which covers evidence of stains from mold contamination. X-90 is designed specifically for unfinished building materials. Anabec X-70 Plus is a latex based coating that seals and creates a moisture barrier for unfinished construction material, and is designed to resist mold and mildew growth. Anabec newBUILD is a latex microbial barrier specifically designed for application to new unfinished building surfaces. newBUILD resists water, bonds to surfaces, won’t wash off and can be painted over.